I'm looking for a few ideas for welding my own sliding gates to use in a race, anyone with plans or photos of something that works well? Every calf deserves a white face. Green grass cures alot of ills. The dream is free. The hustle is sold separate. What do you mean by race? fenceman wrote: What do you mean by race? I believe that means an alley leading up to the squeeze chute, which I think they call a crush. Education is expensive, no matter where you get it. Education is important but, cold beer is importanter. I'm interested in this topic as well, I plan on redoing my alley set up this winter. I've thought about using barn door tracks. I haven't put a lot of thought into it yet. Yes, same thing. Ideally I want to build vertical sliding gates where the exact measurements is going to be more critical. LRTX1 wrote: I'm interested in this topic as well, I plan on redoing my alley set up this winter. I've thought about using barn door tracks. I haven't put a lot of thought into it yet. I have thought of them too, but aren;t they going to be very noisy and with too much leeway? Haven't thought it through well yet, not sold on the idea. I think it would work, just might not be the best idea to work with. I've seen one that lifts vertically once on a farm where I worked cattle, that farm has been turned into a feedlot since so I can't even go back and take measurements and pictures. Most of the ones I have seen, they don't make the gates heavy enough and the gate bends when the cows back up. This puts the rollers in a bind and nothing works right after that. I don't think the barn door tracks would hold up but they might if the door itself doesn't bow. The gate material is the key. A cheap fool proof way to do one is to put some (4) 2 1/2" square tubing posts 3" apart where you want your gate. Two on each side of the chute. Weld a piece of 3" channel between them at ground height to form a track for the gate. The track needs to extend past the chute on the working side. Build your gate out of 1 7/8 OD standard pipe about 6" wider than your race. A little grease in the channel makes it slide a little easier but is really not needed. 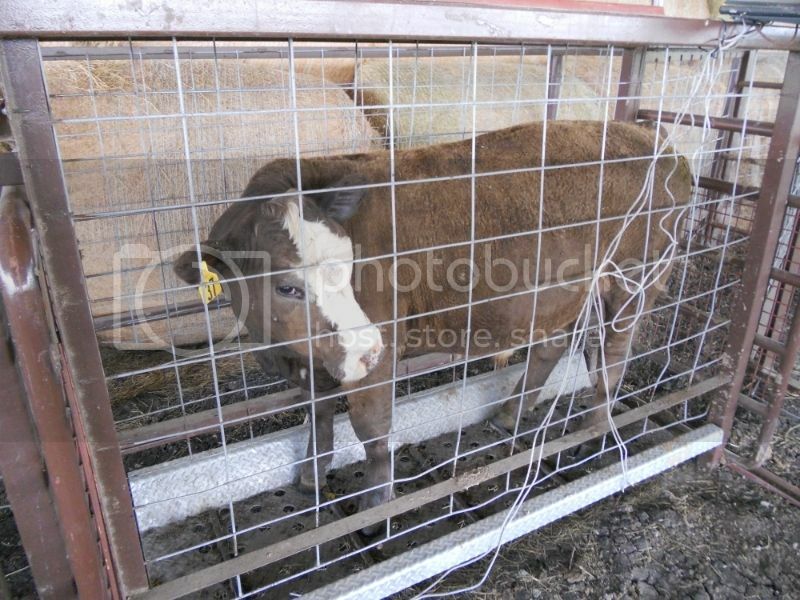 The gate needs to have a solid surface to keep animals from sticking there head thru the bars. I used expanded metal to save on weight. They aren't near as nice as one on rollers but they are maintenance free and cheap to build. bird dog wrote: Most of the ones I have seen, they don't make the gates heavy enough and the gate bends when the cows back up. This puts the rollers in a bind and nothing works right after that. I don't think the barn door tracks would hold up but they might if the door itself doesn't bow. The gate material is the key. Thanks, do you have a pic you can share? There s more ways to do this than to skin a cat. Here's my opinions. Birddogs method of breaking the fence at the gate. Is the way to do it. For horizontal or vertical gates. It leaves nothing sticking out inside the ally. I don't like the track on the ground. I prefer the 3 inch pipe on top of gate frame sliding over 23/8 header.you'll have to set two post for header . One just a couple inches outside fence and the width of gate outside working side. For a vertical gate to the same way. Except both header post will be just outside and against the two fence post (I usually welder them at corners) forming a 4"by4" track for the gate to fall down. I use car spring type latch like you see on a cut gate in a ww or bartop cattle trailer, to hold gate up. You'll have a header across to for strength , and to attach the rope and pulley to. The full track does not need to go to full height. I've found it good to shorten one side of one track post to only catch about 1/3 of the bottom of gate when it's up. And the header height just over that distance above top of gate. This allows a damaged gate to be easily removed for repair. Weight and strength or a issue. I like 17/8 pipe for gate frame. Seek out high tensile pipe. You can use a ss20 wall thickness, and it'll be half the weight and the same strength as ss40 standard pipe. If your going to put expanded metal, go ahead and use some thin sheet metal. If not. Real sorry I can't find any photos. I'll keep looking. Not a very good pic but you can get the gist of what I did. The top rail is continuous. You can see in the front gate where I used angle for the door opening. You can also see on the front gate where I add a cover to prevent them from sticking their heads thru the bars. This was my test subject when I was having trouble with my scales, so thats why the wires are running up the side of the pen. In one of my corrals I left a four inch gap in between posts and stuck an eight foot panel in between the gaps. It sounds bad but I love it. It is indestructible and foolproof. All you have to do is shove the panel across and walk away.